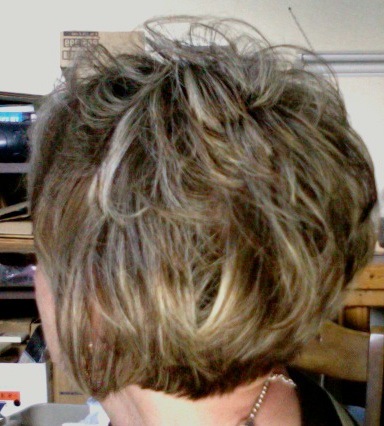 Love my new do. Love the color. Love the shape. Love the fun we had doing it. Mikelle really is amazing me every single day. She’s all grown up. Has her own apartment, [with husband, Logan, of course!] keeps it spotless, has two weeks of school left, has worked like crazy for the past 18 months getting through cosmetology school and supporting herself [mostly.] She has a whole set of new friends but still loves her really ‘true’ ones from back home. She’s working hard to get her life going in the right direction. I so love this daughter of mine! And I love spending a day in the salon with her clipping, plucking and coloring me just how I want. Thanks Kelle! So stinkin’ cute!!! I need Mikelle to live closer to me. We are all in dire hair straits at the moment!